A computer program is a set of instructions that tells a computer how to perform a task. Depending upon the language used, program code my be difficult for humans to read and understand. A high-level programming language like Beginners All-Purpose Symbolic Instruction Code (BASIC) was designed to easy to read by humans. Unfortunately, some versions of basic have been built upon to provide way more power than originally intended, making them difficult to understand. A low-level language like C, was designed to be powerful and efficient, but not so easy to read or understand except by experienced programmers. High-level programming languages get their ease of understanding by hiding the complexity from the user. Behind the scenes, each high-level language statement, actually calls upon many low-level language statements. The "lower" a programming language is, the closer it is to the binary 1s and 0s that computers actually use. People who program microprocessors and microcontrollers at the lowest level use assembly language, which is one step above binary. People who design microprocessors and microcontrollers use register transfer code. An example of a register transfer statement is shown below. This is by no means the most complex register transfer code statement that can be designed. Like most things, computer programming gets easier the more you do it. But initially it starts off difficult to understand. However, one type of "programming" that is very easy to understand is flow charting. To get an understanding of computer architecture you'll need a least an understanding of flow charting. Not only is flow charting very easy to understand, it's also very powerful, not only for understanding computer operation, but also in general life problem solving and decision making. So lets take a look at how flow charts work. 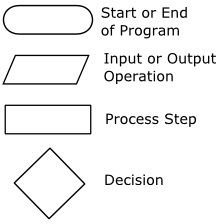 Flow charting uses four basic shapes as shown below. 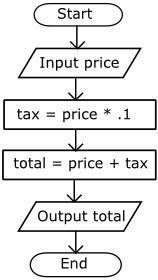 Shown below is the flow chart for a simple sequential program that adds two numbers. This program has limited use because the inputs are constants and there is no output. The inputs to the program shown below are variables (from an input device like a keyboard), and the result of the program's execution is output (to an output device like a screen).